Designed for daily use, the MICHELIN City Pro offers a long life thanks to its robust nature, its puncture resistance and longevity. It grips the road, even on slippery surfaces, with safety paramount for the rider and his passenger. 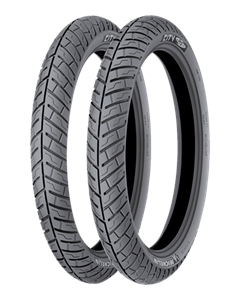 Thanks to the combination of MICHELIN MOT, three reinforced plies and a layer of rubber beneath the tread, the MICHELIN City Pro tyre is extremely robust in order to significantly reduce the risk of puncture. During a test involving 48 motorbikes totalling 400,000km, only four punctures were reported¹. The improved sealing thanks to the layer of rubber on the inside of the tyre limits rubbing of the inner tube. This in turn minimises the risk of pressure loss. Thanks to its long lasting rubber mixture - improved compared to the MICHELIN M35 the MICHELIN City Pro tyre showed throughout 400.000 km of testing it can last an average of 20.000 km². Assured grip - even on wet surfaces, thanks to the tread pattern, profile and grooving. Improved wet grip compared to its predecessor. Its tread pattern is optimised for wet grip with its large circumferential groove and high grooving ratio that facilitates water evacuation.